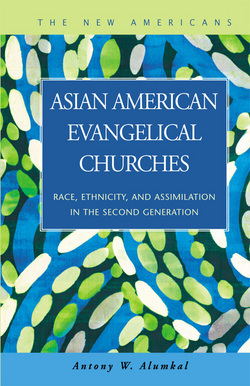 The key aim of this sociological-religious book is to “expand the scholarly knowledge of the religious life among the post-1965 wave of Asian Americans, particularly those of the American born/raised second generation, and of how religion—specifically, American evangelical Christianity—interacts with issues of ethnic and racial identity” (173). For this academic purpose and with race-based religious sociological methodology, Alumkal provides an ethnographic observation on two Asian American churches in the New York City area, namely, the Chinese Community Church, an independent Chinese evangelical church, and the Korean Presbyterian Church, a PC (USA) church. In Chapter Two, Alumkal starts the main body of his writing with a critical observation that the second generation Asian American Christians’ beliefs, faith practices, and theology, stay close to the counterparts of American evangelicalism. Thus, it is inevitable that the second generation shares fundamental traits of American evangelicalism, such as the belief in the absolute inerrancy of the Bible, the dualistic worldview of the select Christian minority (evangelicals) versus the secular world, acceptance of the male-dominant church leadership, the significance of the “born-again” experience, etc. Alumkal gives five reasons that suggest why the second generation has become evangelicals, including the (mis-)understanding of American evangelicalism as traditional Christian orthodoxy. Alumkal anticipates that the second generation’s evangelical propensity will continue. In Chapter Three, Alumkal points out an intriguing sociological-religious phenomenon among the second generation, namely, a “Christian-first” self-identity. He observes that most second generation, evangelical individuals consider their Christian identity to be more significant and fundamental than their racial or ethnic identity. He asks whether this pan-racial Christian-first self-identity has helped the second generation cope with or even overcome their racial minority identity when they interact with American society, in general, which still sees the former as the minority group. Chapter Four discusses how the second generation evangelicals maintain their traditional cultural or ethnic identity and how they distance themselves from it. Both phenomena happen simultaneously. The second generation, though fully absorbed in American culture, language, and evangelicalism, still wants to keep their Asian racial identity and their Asian ethnic church community. At the same time, however, they realize that they are not fully Asians (neither fully Americans), but “Asian-Americans,” a third kind of self-identity. This is why the second generation tends to establish a distinctive worship community under the roof of the first generation’s church. Chapter Five investigates the correlation between the second generation’s evangelical faith and their economic orientation and values. Alumkal finds that the second generation’s evangelical faith does not play a significant role in their choice of careers. Still, he observes that the second generation’s evangelical faith prompts them to do their best at the workplace in order to become good “stewards” of God on earth. In Chapter Six, the gender role/status irony that the second generation evangelicals embody and live through is discussed. In general, they are expected to live with an egalitarian ideal regarding gender roles and status because of their good secular education at secondary and post-secondary institutions, yet they do not. Alumkal observes that their acceptance and practice of typical evangelical patriarchy or gender hierarchy has resulted in gender role/status irony. The second generation evangelical women seem to either take this situation as the “price of admission” to their favored evangelical community, or do not to concern themselves with this issue at all, as long as their spiritual satisfaction is fulfilled. The book is unique in many ways, especially in two critical areas. Firstly, the main research target is the second generation Asian-American evangelical Christians. Their presence has recently increased, both in quality and in quantity in the American religious landscape, yet there are fairly few serious academic works on their religiosity. Secondly, the book is unique in opening a three-fold academic interrogation into the second generation Asian-American’s faith formulation. That is, an Asian-racial based, religious, and American sociological approach. In particular, as the author also points out at the outset, he takes the matter of “race” significantly into his research, a quintessential factor that many other sociologists of religion have ignored when they approached the non-Western or Asian immigrant population in North America. As a whole, this book is a great resource for the study of the critical correlation between religion, race, and society. In particular, this book might be good for practical theologians who have an interest in faith formation and indigenous theological development in the immigrant context. Above all, the book, even though it investigates only two congregations (thus, invoking the problem of generalization), can be greatly appreciated in expanding the socio-religious understanding of the Asian American community. *Note: The book review originally appears at Homiletic.